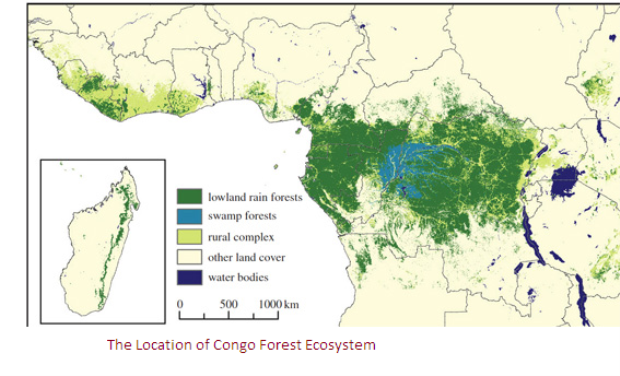 There is a plethora of research on rainforests ecosystem, but the Congo forest has received little apprehension. By comparing to other tropical forests, this ecosystem remains astoundingly healthy. However, its size has significantly reduced due to the impending degradation. It extends over 13 countries that lie within the equator (CARPE, 2013). This region is a home of developing countries where people rely directly on the forest resources for their survival. For this reason, the habitat receives immense threat with its hardwood and biodiversity slowly degraded. Suffice to say that the healthy state of the forests is due to the conservation measures that focus on managing the resources from the imminent danger of the growing population. It has sophisticated hydrological network with Congo River portraying a huge source of water across West Africa. This ecosystem presents enormous benefits to the balance of ecology and existence of diversity. The absolute location of Congo rainforest is 99° North and 79° west. It lies within the equatorial region of central Africa. This ecosystem stretches along the Democratic republic of Congo, Guinea, Equatorial, and Rwanda. This is a stretch along the equator, thus cutting across most of the central African countries. This rainforest does well with ostensibly high precipitation, humidity, and temperature. For that reason, it shows a relatively high rainfall with two seasons of March-June and August-November. It has about 117 raining days annually. In this case, an average of 1800mm of rainfall is received within this ecosystem. The dry season begins in November stretches through to March. Temperatures in this place hits high pitch to support the robust vegetation. Here temperatures show stability throughout the seasons with an average of 15°C difference of day and night temperatures. In essence, the region has a range of 20°-27°C annually. However, regions along the rivers and stream often become cool up to 12°C (Abernethy, Coad, Taylor, Lee, & Maisels, 2013). On the other hand, the humidity maintains at high levels due to the evergreen vegetation. It is usually ranging at 80-90% degrees. The rivers and the rich vegetation support the hydrological system that maintains the conventional rainfall within the region. With high evapotranspiration, it is obvious that the corresponding precipitation will be high. Apparently, the factual evidence of high temperature is because of its location, which is the equator. Therefore, the sun is always shining in the region for about 12 hours daily. With the healthy vegetation, this energy is retained, thus keeping the ecosystem warm. In essence, this region is under the tropical climate classification portrayed by high temperatures and high precipitation. It experiences extreme weather pattern due to the underlying emissions, with significant changes in temperatures. In most cases, Congo Forest has extensive cold day and nights with also more hot days and nights. The emissions seem substantial for these changes. The areas depict a gorge surrounding a valley. Mount Foungouti running in the far south rises above 930 meters with its northern raise being 650 meters. The areas show a sedimentary rock with sand and gravel evident across the forest. However, the top soils are usually replenished due to frequent runoffs that remove organic matter. In the lowlands, the soils are rich of humus from the decaying plants and animals. In this area the soils presents aluminum oxides and iron. Evidently, the region is a low-lying basin that shows little tectonic activities. Most of the geologic activities have ceased for years showing that the area is stable. The heavy rainfall mainly orchestrates erosion and weathering. This is the major agent of erosion; however, the closely compacted vegetation detains its effect. Therefore, the soils in this region are still young showing less vegetation, but high organic processes. The Congo basin demonstrates a Mosaic drainage pattern in that its tributaries arise within a circular form within the ecosystem. River Congo is a central component of hydrology for this ecosystem. It is the second largest river globally for its volume. It has a mosaic structure of rivers with its tributaries converging at the far west to form the Congo River. It has a discharge of 40,000 m3/s causing great erosion through abrasion, scouring, and lifting earth along its course. In this case, the river shall have enormous deposits in form of alluvial compounds downstream and into the Atlantic Ocean. During the raining season, flooding occurs in the region since the R. Congo bursts its bank at this time spreading to the neighboring villages. In the quest to avoid excessive drainage, the region has invested in structural techniques. Along the rivers, there are dykes that help in reducing the velocity of water. Consequently, gibbons and erection of rock walls along the riverbanks come out as the popular structural ways of mitigating flooding. The ecosystem is a tropical forest with relatively high temperatures, rainfall, and humidity. With high rainfall and huge pile of litter, decomposition is slow making the soils devoid of nutrients. The ecology inhabits vast biodiversity with over 10000 species of plants with 30% endemic to this region. Consecutively, it houses endangered wildlife like elephants, bonobo, mountain gorillas, and the chimpanzees (Turvey, 2012). In addition, the ecosystem has decomposers like earthworms, bacteria, mushroom, banana slug, and fungus. The dominant autotrophs come out as the Caesalpiniacae trees, papyrus, Cyperaceae, Okoume trees, and Echnochloa (Chamber & Roberts, 2014). Congo rainforest is one of the tropical ecosystems that have high primary production. Therefore, it has a profound ability to support diverse organisms from secondary producers to decomposers or scavengers. It has many canopies with tall trees supported by stretching taproots. This prevents underground growth, thus less detritus activities. The different canopies support adverse communities of birds, animals, and butterflies. This ecosystem has diverse services like supporting of the entire ecology. They offer energy due to the vast tree and plant communities that in turn allows for nutrients cycling up the chain among consumers and detritus. It is therefore, a critical place for the storage of food and energy. Moreover, the region offers provision services in form of raw materials like wood, water, minerals, food, medicines, or ornaments. The communities have used certain trees like the bromeliads and Epiphytic orchids as medicines for decades. The other service is their cultural significance as they offer sanctuary for native and traditional religious practices. Finally, this ecosystem demonstrates a crucial place in regulating services. Apparently, it has a huge carbon sink and enhances the purification of air and water. For this reason, the Congo forest is one of the areas of carbon sequestration, thus the regulation of climate. It is a habitat of diverse populations of endangered and threatened species. The forest is one of the wildest tropical habitats for animals like mountain gorillas and the forest elephants. The canopies houses birds with over 100 species endemic to this habitat. Most of the snake here are only present in this habitat. Certain plants and animal communities tend to be robust over the rest. The okapi, apes, mouse deer, chimpanzee, elephants, and monkeys are the main primary consumers with the leopards, crocodiles, and lions as the secondary consumers. On the other hand, African oak, mahogany, and red cedar, which are broad leaves trees dominate this ecosystem at the higher canopy. 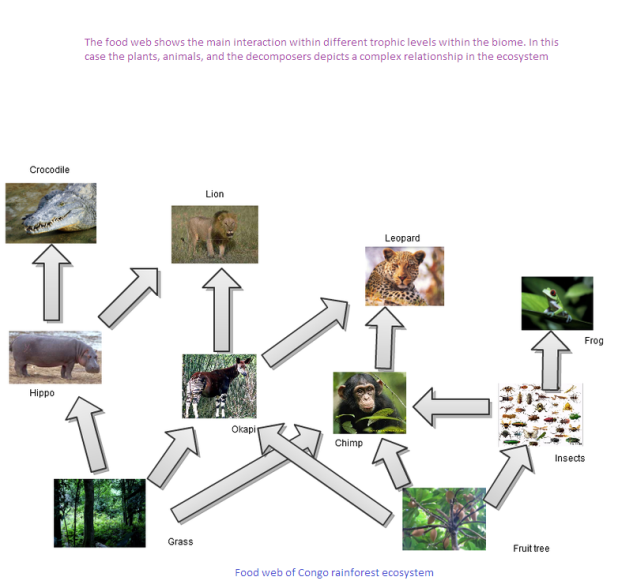 This ecosystem portrays an exemplary food web with crocodiles, leopards, and lions on the higher trophic level. The primary production ranges from vegetation to tree fruits. The okapi, apes, and mouse deer supports the secondary consumers. At the lower level of the trophic level are the insects, fungi, and bacteria. The forest elephant is a relatively smaller than the other African elephant making it fit for the ecological niche. They forage on trees leaves and shrubs. Their skin is difficult for predation and large enough to scare away predators. In essence, they can circumvent under trees due to their small size. This animal is best situated for the tropical rainforest ecosystem, more so its influence in facilitating the germination of African eggplant that has to pass through their duct. In this ecosystem, there is different symbiotic interaction. The bonobo-dialium interaction is one of the positive mutualism within the forest. Dialium tree species are dominant in the region and produce sweet juicy fruits that the Bonobo feeds on. The Bonobo in turn digests the fruits passing the seeds along their guts, thus degrading the hard cuticle and after releasing the seeds in their feces, they are able to germinate. The Bonobo through endozoochory helps Dialium in seed germination and dispersal, thus maintaining their population. On the other hand, a strangler fig is one of the parasites that grow in tree and by reaching up they cover the tree denying them light for photosynthesis later killing them. This is common in the high canopies of Congo forest. Evidently, the human-land interaction comes out as the major threat to the sustainability of this forest. People engage in illegal poaching and encroachment of forest for wood and timber. This has led to the extensive degradation of the forests causing a magnanimous loss of different habitats. Activities such as mining of gold have led to destruction of large tracts of forests within the area. This ecosystem is stable, though it has had numerous anthropogenic threats. However, organizations like WWF and local conservation agencies have ensured that encroachment is minimized and forge to protect endangered species like the bush elephants. The banning of elephant products is a critical step in the preservation of this ecosystem. Abernethy, K. A., Coad, L., Taylor, G., Lee, M. E., & Maisels, F. (2013). Extent and ecological consequences of hunting in Central African rainforests in the twenty-first century . Philosophical Transactions of the Royal Society B, Vol. 368, Iss. 1625, 1. CARPE. (2013). The Forests of the Congo Basin. A Preliminary Assessment, 1=39. Chamber, J. Q., & Roberts, D. A. (2014). Ecology: Drought in the Congo Basin . Nature, 509 , 36-37. "Congo Rainforest Ecosystem." UKEssays.com. 11 2018. All Answers Ltd. 04 2019 <https://www.ukessays.com/essays/geography/congo-rainforest-ecosystem-1293.php?vref=1>. "Congo Rainforest Ecosystem." All Answers Ltd. ukessays.com, November 2018. Web. 20 April 2019. <https://www.ukessays.com/essays/geography/congo-rainforest-ecosystem-1293.php?vref=1>. UKEssays. November 2018. Congo Rainforest Ecosystem. [online]. Available from: https://www.ukessays.com/essays/geography/congo-rainforest-ecosystem-1293.php?vref=1 [Accessed 20 April 2019]. UKEssays. Congo Rainforest Ecosystem [Internet]. November 2018. [Accessed 20 April 2019]; Available from: https://www.ukessays.com/essays/geography/congo-rainforest-ecosystem-1293.php?vref=1.